With a Grand Cru classified red wine and vineyards dating back to the 14th century, Château Smith Haute Lafitte, located 20 minutes outside of the city of Bordeaux, is one of the region’s most prestigious wineries. 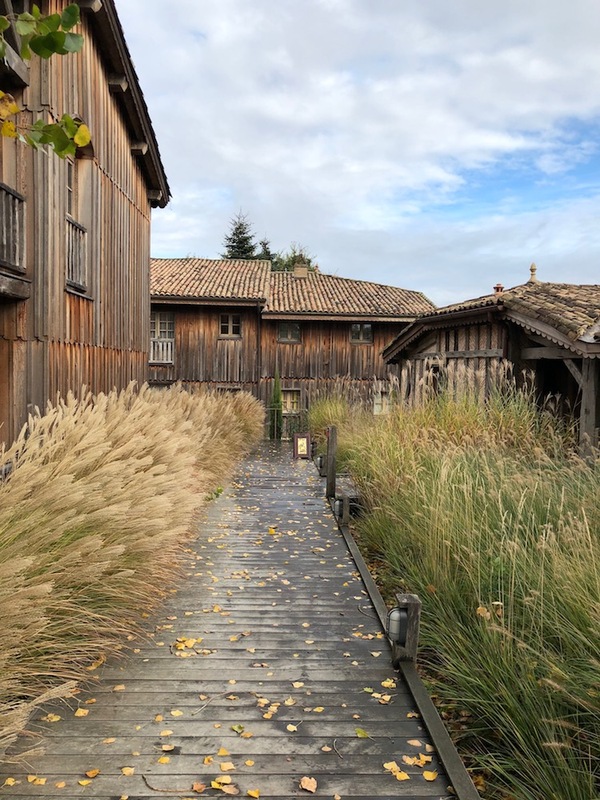 You may be surprised to learn, it’s also among the most family friendly thanks to Land’Art, a private forest on the winery property that has been decorated with contemporary art by winery owners Florence and Daniel Cathiard. The estate is also home to a luxury spa hotel owned by the Cathiard’s daughter and son-in-law. Les Sources de Caudalie is built to look like a French hamlet. Buildings in different architectural styles surround a picturesque pond and there are bikes to rent and gardens to explore. My husband and I, and our son, who was one at the time, had the pleasure of staying there in 2017. Within an hour of arriving we were given a map and pointed in the direction of Land’Art. This sculpture in Land’Art is by Vincent Mauger. I wasn’t quite sure what to expect as we opened an iron gate and walked into the dense forest with foliage turning golden and burnished red, but what followed was truly a journey for the five senses as the map described. On the two hour walk we passed an island, accessible via a rope bridge. The trees on the island were hung with wooden whistles for children to play with. A little further on we passed a 100-year old oak tree. The map encouraged us to touch the bark and put our ear up to the trunk. A sense of calm instantly came over me. It’s true what they say about the healing power of trees. Next to the tree sat what was described as a “witch’s seat.” Madame Cathiard found the stone seat at an antique market. According to local legend it was owned by an actual witch and the map said to make a wish. 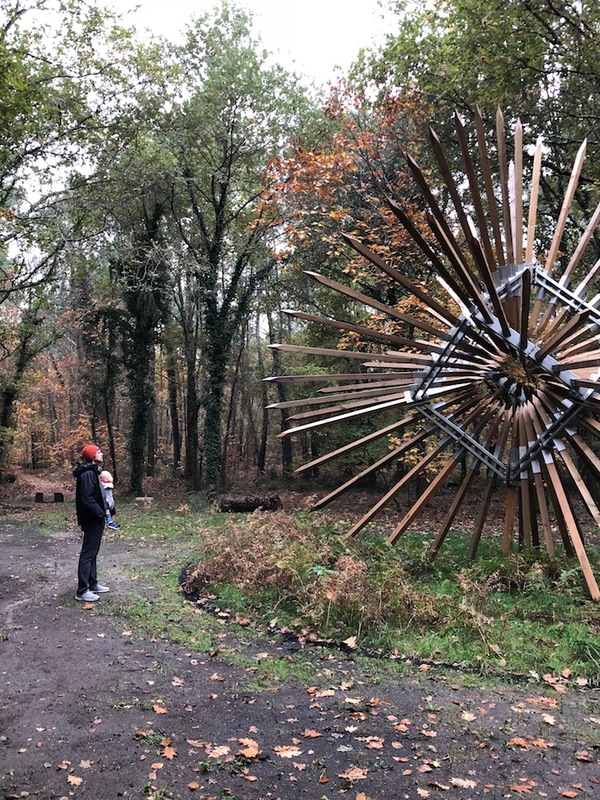 We eventually came to a clearing in the forest and paused to admire a more than 10 foot-tall wooden flower comprised of spikes shooting out at every direction from a steel cube. We found out later it was by up-and-coming artist Vincent Mauger. 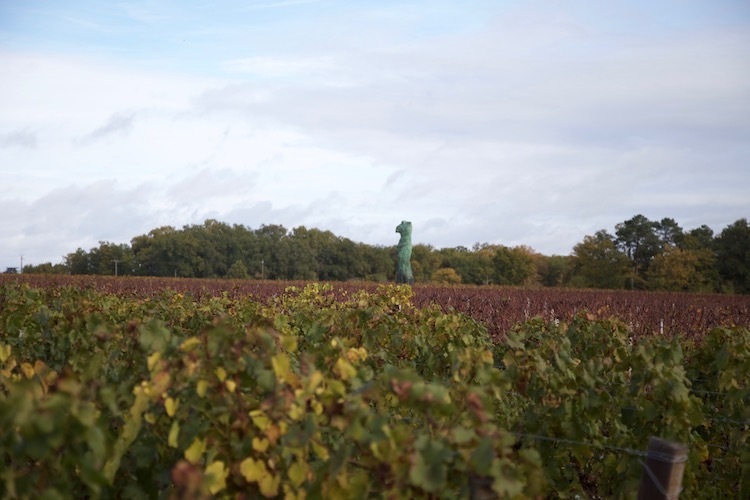 A sculpture peeks out of the vines at Chateau Smith Haute Lafitte. The Cathiard’s love of art is well known in the wine world. Their Pessac-Léognan vineyards are dotted with sculptures by artists such as Jim Dime and Barry Flanagan. Guests of the hotel and winery are already encouraged to walk through the vineyards to admire these artworks. With Land’Art, they’ve taken this concept even further. “It was a way for us to join our two passions, organic wine and art,” says Madame Cathiard. “We go there almost every weekend,” she adds. Château Smith Haute Lafitte’s vineyard’s are farmed organically. 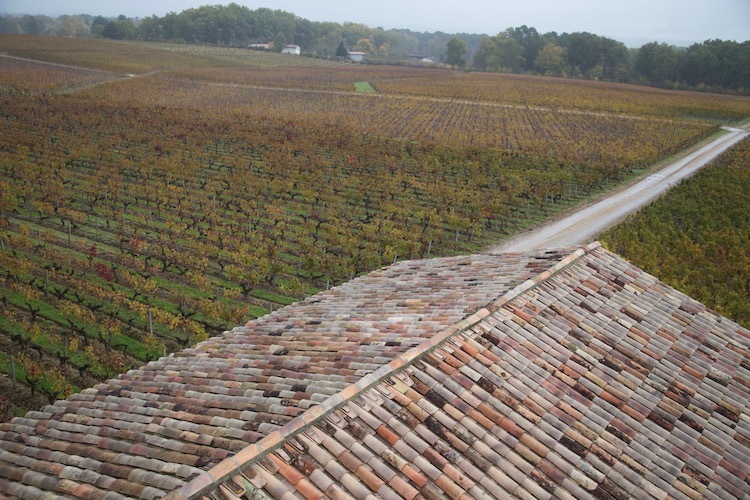 One of the last stops in Land’Art is Château Smith Haut Lafitte’s new Stealth Cellar. Powered by solar, it’s where they make wines from their younger vines and capture CO2 released during fermentation which is then turned into sodium bicarbonate for cleaning and other purposes. The Cathiards were invited to speak about the project at COP21. 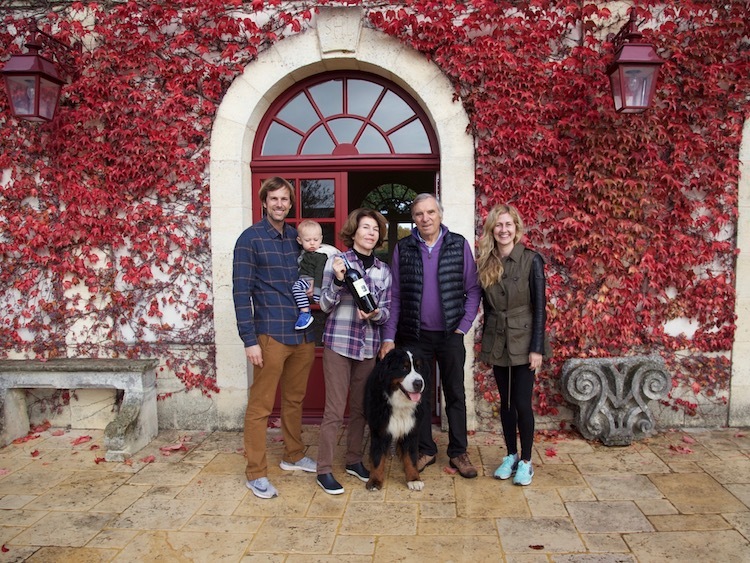 We met the Cathiards, Bordeaux wine making royalty, during our visit. Finally, we passed a small farm with a goat that resembled something out of a fairytale book and who gave off a pungent odor that wards off predators, before we exited the forest and made our way to the domaine. Admission to Land’Art includes a tasting of Château Smith Haute Lafitte’s award winning wines like the intense 2015 Chateau Smith Haute Lafitte Grand Cru to the citrusy and smoky 2015 Le Petite Haute Lafitte White. 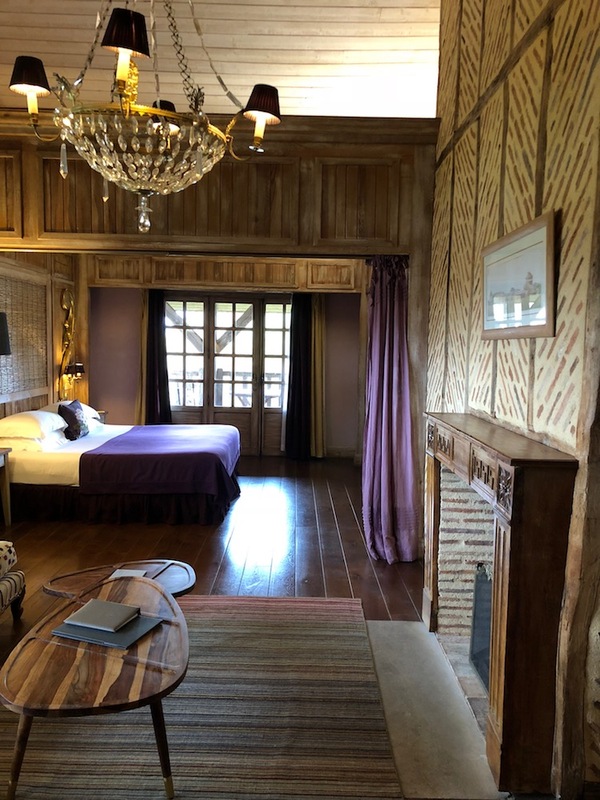 A guest room at Les Sources de Caudalie. Land’Art is 15 euros for hotel guests and 18 euros for non-hotel guests. It’s free for children 12 and under. Rooms at Les Sources de Caudalie start at around $297.